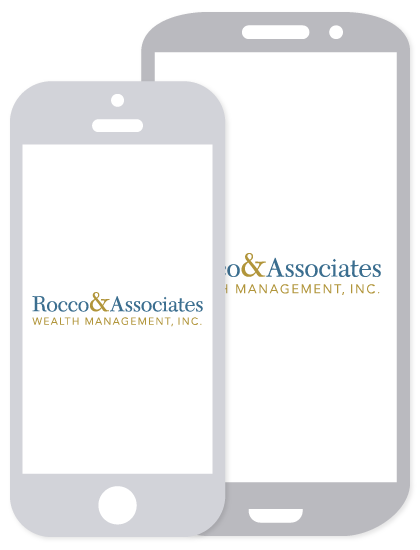 Market Outlook - April 2017 | Rocco & Associates Wealth Management, Inc.
For the upcoming months, your team at Rocco & Associates will be focusing on three themes. One is the growing disconnect between market and economic growth. Another is the return of diversification benefit as active fund managers outpaced passive fund managers last quarter. The third is that almost a year after the initial vote, the United Kingdom is taking the initial steps to withdraw from the European Union. What do these trends mean for the markets? Since the lows of the great recession, market growth, fueled by monetary policy, has significantly outpaced economic growth. We believe that this trend is not sustainable longer term. Unless we see strengthening economic indications, market growth could slow significantly over the next 5+ years. One indication of this is an increase in home sales and purchases of durable goods despite the recent decline in the market. 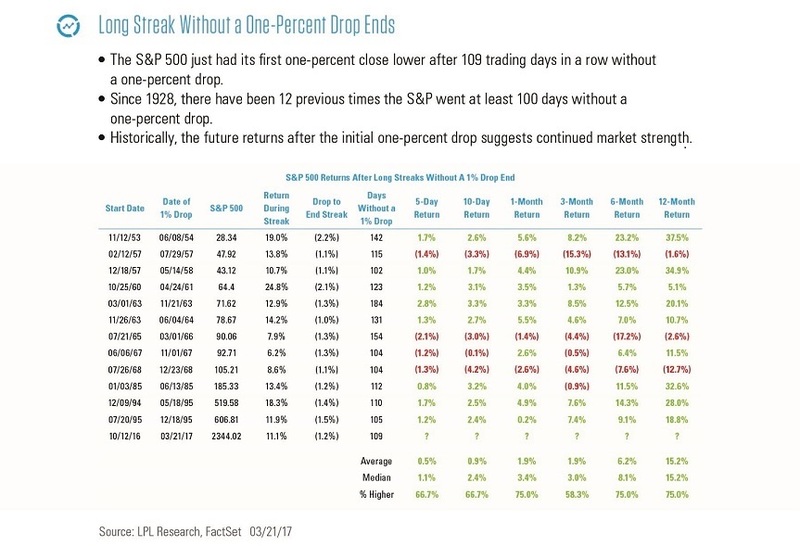 The S&P just had its first 1% drop after 109 trading days in a row without one (illustrated in the chart below). Indices are unmanaged and cannot be invested into directly. Unmanaged index returns do not reflect fees, expenses, or sales charges. Index performance is not indicative of the performance of any investment. Past performance is no guarantee of future results. The Standard & Poor's 500 Index is a capitalization-weighted index of 500 stocks designed to measure performance of the broad domestic economy through changes in the aggregate market value of 500 stocks representing all major industries. 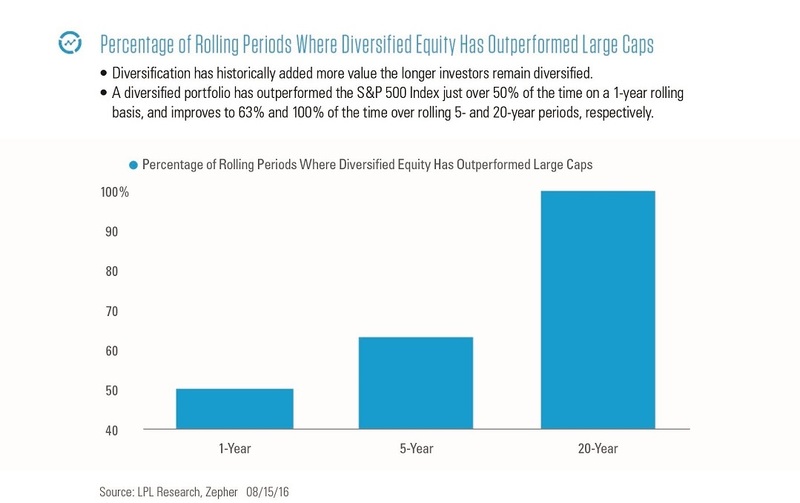 Next, the recent performance of active fund managers may indicate that diversified portfolios could achieve long-term success (visible in the chart below). A recent Nasdaq article suggests that we are witnessing a passive investing bubble that will not be successful long-term despite the current favoring of passive over active funds. At Rocco & Associates, we believe that both active and passive management styles have a place in your portfolio, but there must be a proper balance based on your risk tolerance and retirement time horizon. Past performance is no guarantee of future results. There is no guarantee that a diversified portfolio will enhance overall returns or outperform a non-diversified portfolio. Diversification does not protect against market risk. Finally, the United Kingdom is taking the first steps to leave the European Union. The process is anticipated to take upwards of two years, with control over immigration being prioritized over economic gains, according to the New York Times. Both the United Kingdom and the European Union would like to reach an agreeable settlement, potentially indicating that the split will not be as catastrophic as the markets suggested last June. We continue to believe that the markets will slow down over the next several years, and will maintain that view until otherwise indicated by a pickup in economic activity. However, the success of active fund managers suggests long-term success is possible in slow growth markets. Also, we will continue to monitor the stability of the global economy and its impact on our country’s own financial health. As always, your plan takes these various factors into account, but should you want to review in more details don’t hesitate to reach out!